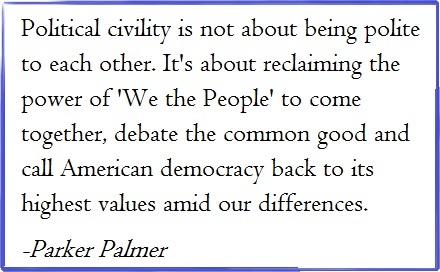 With the opening of the Second Regular Session of the 70th General Assembly, now might be a good time to spend a few minutes thinking about civility and why it’s important. The Colorado General Assembly actually doesn’t have a problem with civility; the debates under the Gold Dome are, in most instances, very civil and relationships are generally cordial. But the General Assembly is facing many important issues this year and there is significant disagreement on how to address most of them. And it’s an election year. So reviewing what we know about the importance of civility and what civility means is time well spent. Civility is about more than just politeness, although politeness is a necessary first step. It is about disagreeing without disrespect, seeking common ground as a starting point for dialogue about differences, listening past one’s preconceptions, and teaching others to do the same. Civility is the hard work of staying present even with those with whom we have deep-rooted and fierce disagreements. It is political in the sense that it is a necessary prerequisite for civic action. But it is political, too, in the sense that it is about negotiating interpersonal power such that everyone’s voice is heard, and nobody’s is ignored. the ability to disagree productively with others, respecting their sincerity and decency. Civility does not mean agreement. We think citizens are well served when political parties represent different viewpoints and then compete vigorously to recruit voters to their side. Second – why is civility important? Recently, an organization called FairVote teamed with the Bipartisan Policy Center to look at state legislatures in which one of the chambers was evenly split between Republicans and Democrats and how the chambers made power-sharing work. In their report – Best Practices for Collaborative Policymaking – they looked at the Oklahoma Senate (2007-08), the Oregon House (2011-12), and the Washington House (1999-2001). While tied, each chamber adopted what is called a “co” agreement – pairs of members from each party held the leadership and committee chair positions. Interestingly, legislators from Oklahoma and Oregon described their time under the “co” agreements as being very productive and cooperative. Legislators in both states remembered these years as times of great bipartisan agreement and civility. In Washington, however, the legislators remembered their years of power-sharing as a time of gridlock during which few significant bills were passed and partisanship was especially rampant. The report concludes that one reason is a difference in how the legislative rules in each state distributed the power to control the agenda. In both Oklahoma and Oregon, the rules ensured that both parties were able to get their legislation on the committee calendar and on the House second reading calendar without being blocked by the other party. In Washington, however, committee co-chairs had to agree to calendar legislation for committee hearings, and each co-Speaker could block consideration of the other party’s legislation on second reading. Each party used this power in retaliation for actions by the other party, leading both parties to feel shut out of the process. And in Oklahoma and Oregon, where the power-sharing agreements were successful, the researchers found that the co-chairs of committees and the rest of the legislators in the House followed the example of trust and mutual respect set by the co-Speakers. Further, the co-Speakers specifically emphasized civility and cooperation from the beginning of the session. Even though Colorado’s General Assembly isn’t operating under a power-sharing agreement within a single house, control of the chambers is split between the parties: Republicans hold the majority in the Senate and Democrats hold the majority in the House. This means that relationships of trust, mutual respect, and civility between the leadership in the two chambers and among all of the legislators are the key to a successful legislative session for the entire General Assembly. Respect the right of all Americans to hold different opinions. Avoid rhetoric intended to humiliate, de-legitimatize or question the patriotism of those whose opinions are different from ours. Strive to understand differing perspectives. Speak truthfully without accusation and avoid distortion. Speak out against violence, prejudice, and incivility in all their forms, whenever and wherever they occur. We … pledge to exhibit and encourage the kind of personal qualities that are emblematic of a civil society: gratitude, humility, openness, passion for service to others, propriety, kindness, caring, faith, sense of duty and a commitment to doing what is right. Good words to keep in mind as the legislative session progresses. Previous Post: Sponsors and Deadlines and Bills, Oh My!